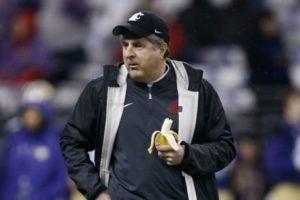 I haven’t done one of these 2020 recruiting updates in a while, because it seems like there’s so much action with the current recruiting class. 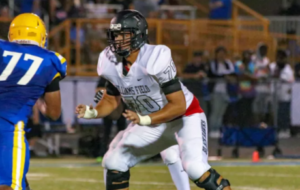 But here’s a huge dump of information on the 2020 recruits on the defensive side of the ball, along with some guys who committed to other schools. Columbus (OH) Northland wide receiver Kalil Branham committed to Michigan (LINK). Belleville (MI) Belleville cornerback Andre Seldon, Jr. committed to Michigan (LINK). Fort Lauderdale (FL) St. Thomas Aquinas defensive end Devon Betty was offered by Michigan. He’s a 6’0″, 190 lb. prospect with offers from Ohio State, Oklahoma, and South Carolina, among others. He’s a 247 Sports 4-star, the #5 outside linebacker, and #57 overall. 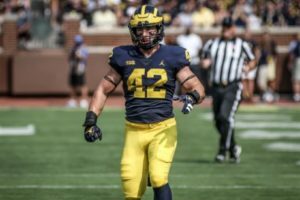 Michigan has made several attempts to get a foothold at Aquinas, but it’s tough sledding at a powerhouse program that every big-time program recruits. Orlando (FL) Dr. Phillips linebacker Stephen Dix, Jr. was offered by Michigan. He’s a 6’0″, 205 lb. outside linebacker with offers from Clemson, Florida, and Ohio State, among others. He’s a 247 Sports 3-star, the #23 outside linebacker, and #325 overall. 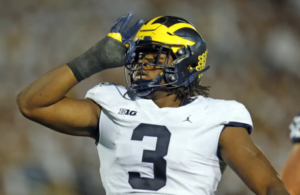 He attends the alma mater of former Michigan commit Demetrius Hart, and it’s where former Michigan tight end Ricardo Miller began his high school career before transferring to Ann Arbor (MI) Pioneer. 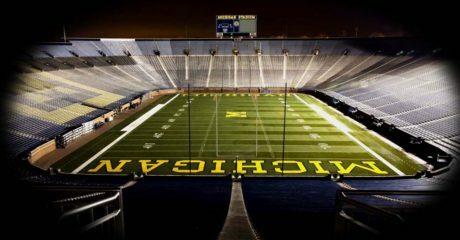 Highland Springs (VA) Highland Springs safety Malcolm Greene was offered by Michigan. He’s a 5’11”, 180 lb. 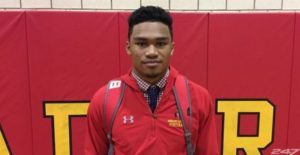 prospect with offers from Maryland, North Carolina, and Virginia Tech, among others. He claims a 4.57 forty, a 230 lb. bench, and a 350 lb. squat. Hit the jump for several more player updates. Orlando (FL) Dr. Phillips cornerback Tevin Griffey was offered by Michigan. 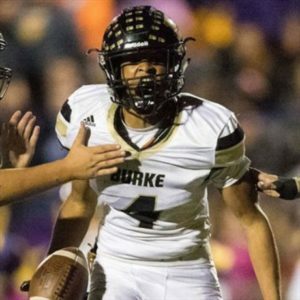 He’s 5’10” and 160 lbs., and so far no other schools have offered. 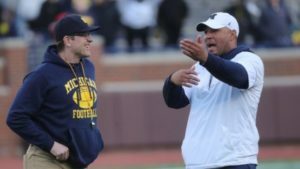 He’s the son of former Major League Baseball star Ken Griffey, Jr.
Washington (DC) St. John’s cornerback Luke Hill was offered by Michigan. He’s a 5’11”, 180-pounder with offers from Alabama, Florida, Oklahoma, and Penn State, among others. He’s a 4-star, the #7 cornerback, and #73 overall. He’s a teammate of 2019 safety Quinten Johnson, whom many believe will end up at Michigan. Harbor City (CA) Harbonne safety Joshua Jackson, Jr. was offered by Michigan. He’s a 6’2″, 185 lb. prospect with offers from Florida, Oregon, and USC, among others. He’s a 247 Sports 3-star, the #61 wide receiver, and #306 overall. 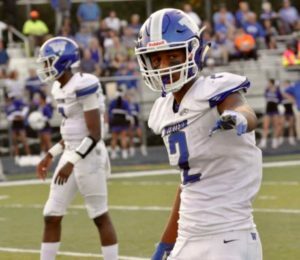 Louisville (KY) Butler cornerback Darius Jones was offered by Michigan. He’s a 5’9″, 160-pounder who does not have any other offers at this point. He’s a teammate of 2019 wide receiver Demontae Crumes, who also earned an offer from the Wolverines. 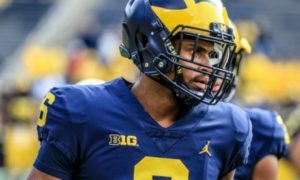 Calera (AL) Calera defensive tackle Jayson Jones was offered by Michigan. He’s a 6’5″, 322 lb. 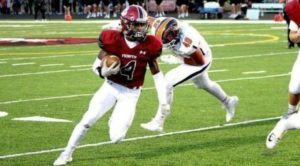 prospect who has offers from Alabama, Florida State, Georgia, and LSU, but he has already set an announcement date for the Fourth of July, and he’s probably picking the Crimson Tide. 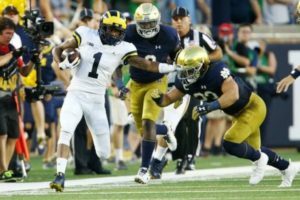 Opa Locka (FL) Monsignor Pace cornerback Jaheem Joseph was offered by Michigan. He’s a 5’11”, 170-pounder with offers from FAU, Louisville, Marshall, and Syracuse. 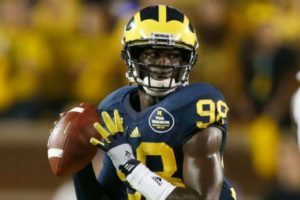 Miami would probably be the front-runner if they offered, and he appears likely to stay down south. Stone Mountain (GA) Stephenson cornerback Javier Morton, an Alabama commit, was offered by Michigan. He’s a 6’1″, 175 lb. 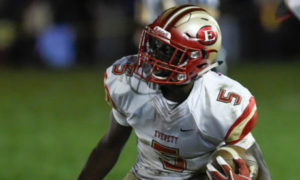 prospect with offers from Auburn, Georgia, Ohio State, and Penn State, among others, but he committed to the Crimson Tide in December of 2017. Miami (FL) Gulliver Prep defensive tackle Westley Neal was offered by Michigan. He’s a 5’11”, 311 lb. prospect with offers from Boston College, Florida State, and Kentucky, among others. 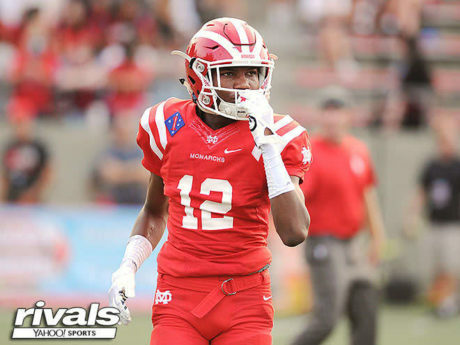 Santa Ana (CA) Mater Dei cornerback Elias Ricks was offered by Michigan. 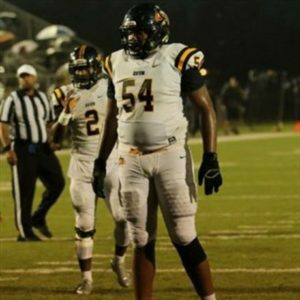 He’s a 6’2″, 180-pounder with offers from Alabama, Georgia, LSU, Notre Dame, Oklahoma, Oregon, and USC, among others. He’s a 5-star, the #2 cornerback, and #19 overall. He’s a long, elite athlete, and he plays for one of the biggest powerhouses in the country. Scottsdale (AZ) Saguaro linebacker Damian Sellers was offered by Michigan. He stands 6’4″ and 205 lbs., and he has offers from Alabama, LSU, Oklahoma, and Oregon, among others. He’s a 247 Sports 4-star, the #7 outside linebacker, and #117 overall. He often plays with his hand down and could be a weakside end at the next level. Broken Arrow (OK) Broken Arrow cornerback Myles Slusher was offered by Michigan. He’s a 5’10”, 170 lb. prospect with offers from LSU, Oklahoma State, and Texas, among others. He had 41 tackles and 4 interceptions as a sophomore in 2017. He has good cover skills, but he’s also a very effective tackler. Aurora (IL) West defensive tackle Denver Warren was offered by Michigan. He’s a 6’2″, 318 lb. prospect with offers from Illinois, Iowa, Penn State, and Wisconsin, among others. He’s a 247 Sports 3-star, the #21 defensive tackle, and #283 overall. 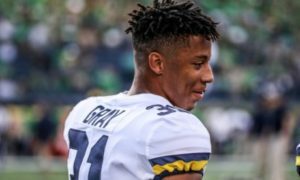 He took an unofficial visit to Michigan last weekend and immediately named the Wolverines his #1 pick, resulting in several crystal ball predictions for Michigan. 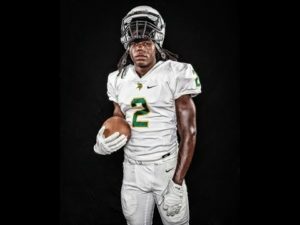 Deland (FL) Deland safety Avantae Williams was offered by Michigan. He’s a 6’0″, 170-punder with offers from Alabama, Florida, Florida State, Miami, and Oklahoma, among others. He’s a 4-star, the #4 athlete, and #64 overall. He could play receiver, cornerback, or safety at the next level. Miami (FL) Doral Academy defensive end Samuel Anaele committed to Miami. Red Bank (NJ) Catholic tight end Kevin Bauman committed to Notre Dame. Austin (TX) Lake Travis quarterback Hudson Card committed to Texas. 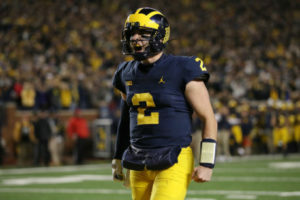 He’s the #4 dual-threat quarterback and #212 overall. LaGrange (GA) Troup County wide receiver Kobe Hudson committed to Auburn. He averaged 20 yards/catch and scored 12 touchdowns as a sophomore. Deerfield Beach (FL) Deerfield Beach running back Jaylan Knighton committed to Oklahoma. None of these players visited Michigan.